Sunstone • The spiritual journey of Maxine Hanks, one of the "September Six,'" comes full circle. Though a lifelong Latter-day Saint, Hanks had not been attending a Mormon ward for several years. Then she was accused of apostasy for editing an anthology, Women and Authority: Re-Emerging Mormon Feminism, which included a discussion of the all-male LDS priesthood and women's relationship to it. Hanks was excommunicated in 1993, one of the "September Six," Mormon writers and scholars who were disciplined by their local LDS officials in the same month. Since then, only one  Avraham Gileadi, an Old Testament scholar who has spent his life researching and writing about the biblical oracle Isaiah's prophecies about our time  has been rebaptized into the faith. Hanks rejoined The Church of Jesus Christ of Latter-day Saints in February. 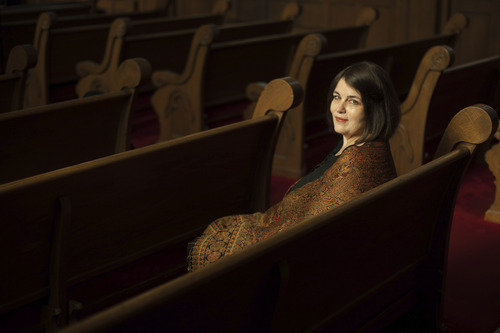 On Friday , during a popular evening session of next week's Sunstone Symposium, an annual meeting for Mormon intellectuals and observers, Hanks will detail her 20-year spiritual sojourn as a feminist theologian and chaplain, which brought her full circle back into Mormonism. "Given who I was, there was no place to go but out," Hanks said in 2003, on the 10th anniversary of the excommunications. "Mormonism was limiting to me, so I needed to test the limits  to see who I and the church really might be. … Excommunication opened the door to a larger cosmos, inside and outside myself." From that point on, she explored various Christian teachings and practices, assisted clergy with religious services and served as volunteer chaplain at Holy Cross Chapel for 13 years. In 1999, she joined the Interfaith Roundtable for the 2002 Winter Olympics, where she enjoyed the association of representatives from various faiths and led the annual Interfaith Week. She studied "traditional, sacramental Christianity and priesthood," Hanks said this week. "But when I got to the point of priestly ordination, I pulled back. I moved into recognizing the value and power of a lay priesthood in the body of Christ and Christian community. My searching was complete. I had my answers." Her explorations gave Hanks a new level of understanding and "testimony" of Mormonism. Late last year, a friend approached LDS officials to say that Hanks was ready to return to the fold. They were receptive. So she met with local and high Mormon leaders and, after several months, they set a baptismal date. "Nobody asked me to disavow my book or stop writing," Hanks said. "All they asked me about was my relationship to Jesus Christ." Hanks' rebaptism suggests a difference in LDS leadership from then to now, said Dan Wotherspoon, Sunstone's editor from 2001 to 2008. In the past, many Mormon officials had a sense, he said, that the church must protect its members from "wolves among them." In May 1993, apostle Boyd K. Packer said the church's three greatest threats came from feminists, gays and intellectuals. Today, LDS leaders seem more inclined to recognize, said Wotherspoon, now host of the "Mormon Matters" podcast, "that Zion is made up of people of all types." Hanks is a "genuinely spiritual person and quite insightful, who brings a type of spirituality with her that will resonate with lots of people," he said. "She might be a model for others who have been missing their Mormon community." The symposium's "Pillars of My Faith" session will showcase a similar path, said Mary Ellen Robertson, Sunstone's interim executive director. Years ago, Don Bradley, a longtime scholar of Mormon history, asked to have his name removed from LDS membership rolls when participation became uncomfortable. Within the past few years, Bradley had a change of heart and was rebaptized. Bradley and Hanks are friends who trod a lot of common ground, Robertson said. The four-day symposium, which begins Wednesday evening, also will include dozens of sessions about Mormonism and politics, about how members grapple with contemporary issues such as gay rights and feminism, building online LDS communities, Mormon Latino views of the church's immigration stance and how the Utah-based faith has developed its "brand" in the past several decades. But Robertson is especially pleased with the "Pillars" session. "It will be a chance for a larger audience to hear this story," she said, and to hear how people can wrestle with their faith and then live it out.